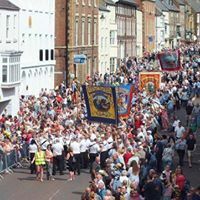 The Durham Miners Gala is one of the biggest events of its’ kind anywhere in the country and is a great day. The band supports the residents of Kelloe and Quarrington Hill as they process their banners through the villages. Heading into Durham, the band and villages join one of three routes which process into the city centre, converging on the County Hotel. Jeremy Corbyn, fresh from Glastonbury, was out on the balcony to hear the band perform Grease Lighting before making their way on to the University Playing Fields. Enormous crowds line the streets for the procession and to listen to the speeches. The energy of the event is hard to convey, it has to be experienced to be believed! This entry was posted in News-All. Bookmark the permalink.